Have you heard? 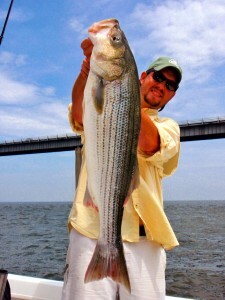 Light tackle casting is producing big fish lately on the Chesapeake Bay. Some lucky anglers are catching fish over 30-inches on almost every trip. Sometimes they get three or four. Most of the fish I’m catching are coming off cover like rocks or bridge pilings, but some have been hooked while fishing submerged structure in open water. Both soft plastics and metal jigs are producing. If you’ve been out, I hope you’re enjoying some lucky days. 30-inch plus stripers in late June is something to celebrate, especially considering how tough fishing has been previously. Braided Line – The difference between success and failure often comes down to basic equipment. Start with good braided line. By good, I don’t mean heavy. 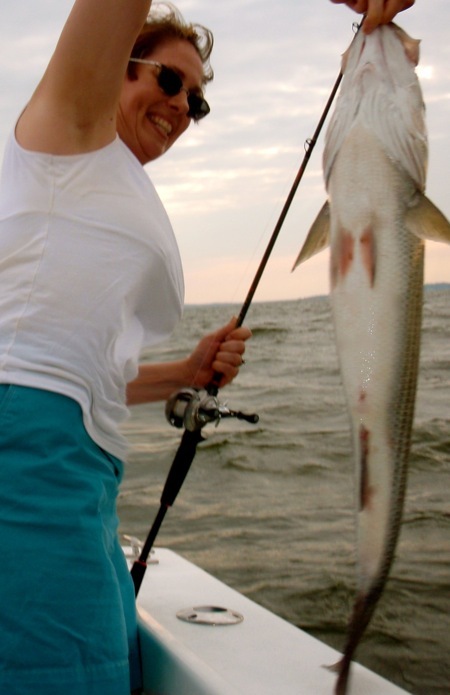 One of the biggest mistakes light tackle fishermen make is using line that is too heavy. The size line you use depends on three factors, the species of fish, the obstructions in the water, and the skill of the angler. 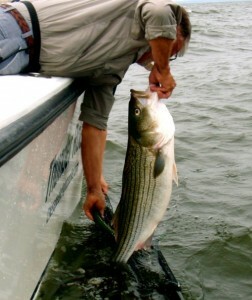 When fishing open water for striped bass in the summer, I use 10-pound test, always the same brand. Braided line is a lot more sensitive than mono and since it doesn’t stretch it makes setting the hook a lot faster. Another big advantage is that braid cuts through the water easier and doesn’t drag in the current. A straight line with no bows or bends between you and your lure means you feel more strikes. Better yet, you get more solid hook sets so you land more fish. Leader – There are also some disadvantages to braid. One of the biggest is that it isn’t resistant to abrasion. 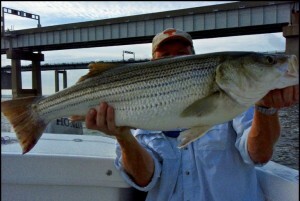 Striped bass have very sharp gill plates and dorsal fins that will slice through braid like a knife through butter. They also hang out around rocks, piers, bridge pilings, and other places that can cut braid. 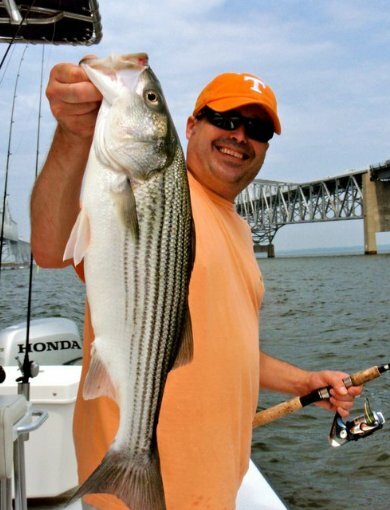 Since stripers aren’t particularly leader-shy, use a 25 to 40-pound test leader, either mono or fluorocarbon that is long enough to clear the dorsal fin on the biggest fish you want to catch. Make sure you check your leader and your braid frequently for nicks or frays and retie when necessary. A leader also gives you something to grab on to when you’re landing a fish. Knots – I use a double-uni knot to attach the leader to the braid, and an improved clinch knot to tie on the jig. Most of my buddies like loop knots on the jig. I don’t have an opinion about which one works best, but I’ve been successful with what I use. The most important thing is to tie the knot correctly and check it frequently. It’s also smart to retie after you catch a big fish, or after landing several small fish. Hooks – There’s nothing more frustrating than successfully hooking a big summer fish only to have it come unpinned. If your fish seem to just be pulling free, the culprit is probably the hook. The hooks on most off-the-shelf jig heads have gaps that are too narrow, especially with sizes of 3/4-ounce and smaller. (Gap is the distance between the point and the shaft of the hook.) It’s best to spend the extra money and get good wide-gapped hooks. The wide gap gives you better penetration and deeper hook sets. The BKD company puts good hook sizes in their lighter jig heads, or you can pour your own. Another tip is to keep a whetstone handy and sharpen your hooks frequently. Mashing the barbs allows the hook to penetrate deeper and faster and will also result in better hook sets. Better hook sets means you lose fewer fish. Weight – Speaking of jig heads, when it comes to light tackle casting, one size definitely does NOT fit all. Better light tackle fishermen will change the weight of their jigs many times during the course of an afternoon. Chesapeake Bay conditions are always changing. Maybe the current gets strong, then slows, or the wind comes up, then goes down, water depths can change, sometimes fish suspend, sometimes they lay on the bottom – these are all factors to consider when choosing the proper weight. For suspended fish, lighter is better, but for the piling bite or fishing mid-Bay oyster humps, you want something heavy enough to feel the bottom on every drop. Drag – How many times does the big one get away? It’s one thing to hook a big summer rockfish, but something else entirely to land it. I usually check my drag before every cast. I want it stiff enough so that it takes some effort to pull line off the reel, but not so loose that the spool spins easily. Drag is measured in pounds of resistance. Some baitcasters have drags that can be set to 20 pounds or stronger. That’s way too strong for 10 or 15-pound test line. A good rule of thumb is to set your drag at about a quarter of the breaking strength of the line you are using. So, for my 10-pound-test, I set the drag at about 2.5 pounds or maybe just a little stronger. I’ve seen anglers fish with a very loose drag, then tighten it when they get a fish on. I’m not sure that’s a good idea because it takes your concentration away from the fish you are fighting, and it increases the chances that you might over-tighten and break off. You can’t really gauge how tight your drag is when a fish is pulling against it. Another frequent mistake is to tighten the drag in order to pull the hook free from a snag, then forget to loosen it before casting again. Chances are, that’s the cast when the big one hits. Go Big – Most fishermen understand the concept of matching the hatch. Fortunately, almost all store-brand lures are two to six inches long which is about the size of peanut bunker, the most readily available summer baitfish. Don’t let that lull you into thinking that’s all the fish will bite. If I find myself consistently catching 25 inch fish or bigger, I start wondering if there might be a big old sow striper down there that could possibly be interested in a bigger bite. I change to 10-inch BKDs as soon as I’m sure I’m on quality fish. I don’t catch as many fish after I move up to big baits, but the ones I hook are usually the biggest in the school. Go Bright – By now you surely know that I think alternating colored lures result in more strikes from rockfish. Contrasting colors simulate the gill flash of a bolting baitfish. 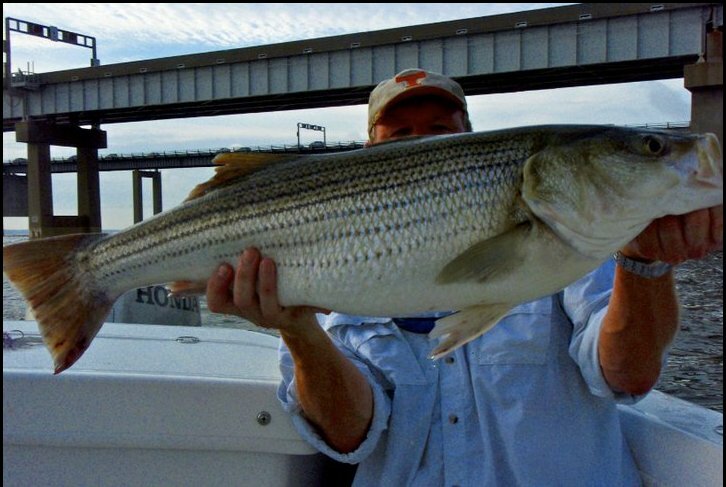 That can induce a striper to hit the lure out of instinct. I dip or paint my soft plastic lures with a bright contrasting color and I tie bright bucktail or feathers on to the hooks of my metal jigs. I can’t say every big fish I’ve seen caught has come on lures with alternating colors, but I can say most of the biggest ones have. Nets – Dip nets lose fish. That’s important enough to say again, dip nets lose fish. There’s absolutely no need for a dip net to land striped bass if you’re fishing out of a boat with sides low enough so you can reach the water. 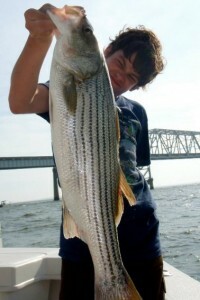 Stripers don’t have soft mouths like trout or flounder, so they don’t often pull lose at the side of the boat. Just reel the fish up to the gunwale, reach down and grab the leader with one hand and the lip of the fish with the other. It’s easy as pie and you usually don’t have to take them out of the water to release them. The problem with dip nets is that both the netter and the angler must work in perfect tandem. In the excitement of the moment, that rarely happens. Usually, the netter makes a few unsuccessful stabs at the fish either knocking it off the hook or exciting it so much that it flops free. If you must use a net, try one of the newer cradle style nets. You just drag the fish into it like dragging it up on the bank. There’s less margin for error and it makes it easy to keep the fish in the water. Obviously, anyone can get lucky, but there’s no denying that some anglers have consistently better luck. When fish are turned on and feeding, almost any method or technique will work. 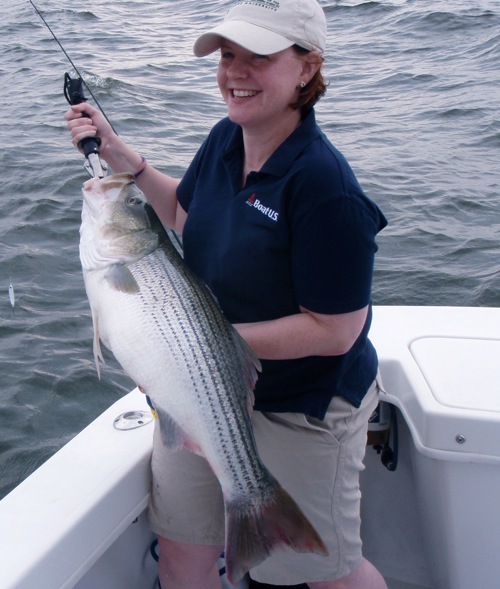 However, if you’ve seen enough twenty-inch rockfish for this summer, why not increase your chances with just a few subtle changes that can make a big difference in the size of the fish. All the fish in this report were landed in the past seven days. They’re ready and waiting, so get out there and get lucky! Re-tie after a big fish or several smaller ones… or at the beginning of a new trip. Lost a nice fish at the boat Sat morning because I didn’t heed this oft stated advice. I’m bad about palming the spool on a spinning reel when a larger fishes rips out line instead of letting the drag work. It’s habit carried from palming a fly reel. Works sometimes and results in break-offs if I don’t re-tie often. Great report as usual, I fish out of Easton and tried to get out Sunday, only to get blown out coming around Tilghman Point, had to settle for a good day of croaker in the Tred Avon. You often speak of sturcture and oystrer humps, without giving away your secrets, can you give me some hints of good Mid Bay, Choptank locatons.Please. good ‘lukin’ group you got on board captain! I like the Palomar for jigs. I swear it feels “tighter” somehow…as far as retying, wet your lips and run your leader through them. You can feel nicks/abrasions much better than with your fingers. Check the leader at the uni knot too. I think I lost a fish up there because the leader failed at the uni, and I know I lost some nice, sharp, wide-gap jig heads because of it. This map will also provide names to a lot of good places to fish. I’ll sometimes throw out a name that you can find on this map. For example, I recently mentioned Strong Bay and in a report last fall I mentioned a good bite at Sedge Marsh. Most people don’t know where those places are, so I don’t feel like I’m burning my spots to anyone but people who get the importance of fishing over live bottoms. A good strategy is to motor over the bar with your fishfinder and GPS and look for humps and ledges. The more dramatic the relief, the more likely fish will use it. Other than bridges and warm water discharges, all my post spawn hot spots are located in named bars. 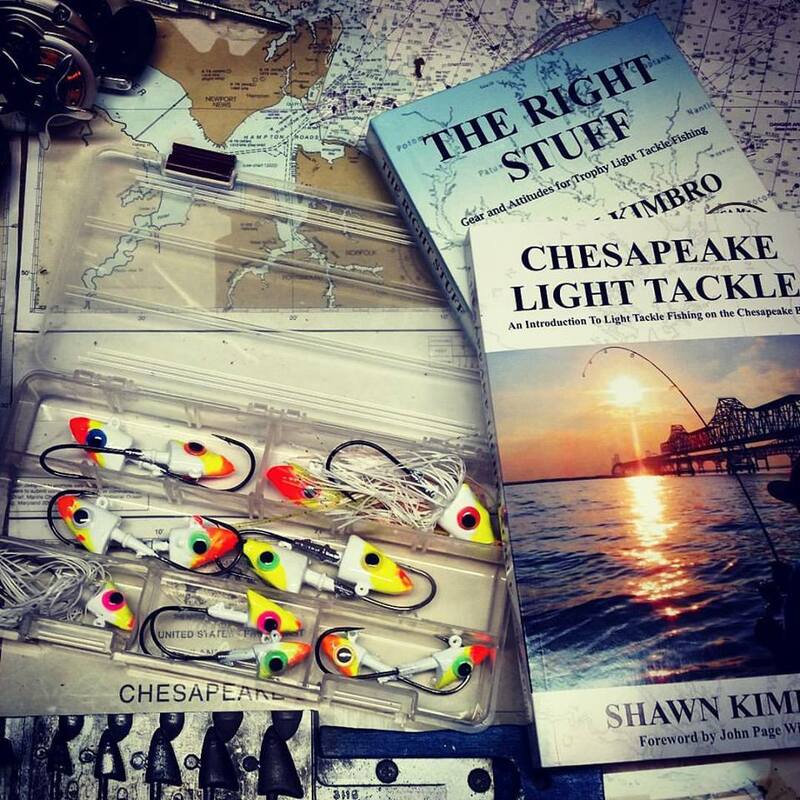 Thanks Shawn, I appreciate any help, I am hooked on light tackle and your site has been a great help. How can you not use a leader with thin braid? You’ll need hands of leather to safely land fish. My contributions are: 1.) look for short shank wide gap hooks. Rockfish engulf prey whole rather than slash at it, so the hook tends to remain closer the mouth rather than penetrating deeper. 2.) Rig the BKD (or similiar) with the slit up. Its easier to ensure its on straight and also allows for more action to the lure. What hook are you using when pouring jigs? I just did a quick lead session with my new jig mold and used the eagle claw 635s. The gap is not nearly as big as the jigs BKD sells. Chris – Mustad 32786BLN is a good quality, relatively inexpensive wide-gap hook. I saw your post on the Maryland DNR site and was impressed by the cleanliness of both the water and the striped bass! You posted on June 30th…the same day I happened to be fishing at the Preston Lane Memorial Bridge. The water clarity and quality of fish was vastly different during my trip. TIm Klien (email provided: hardtobelieve@fishingpics.com) I know it’s hard to believe unless you see it for yourself. I had some pretty reliable witnesses that day. Our fishing trip was June 27 and you guessed right that one of our half-dozen fishing stops was at the Bay Bridge. (grin) “Tim’s” post at least gives us a good opportunity to point out how vastly different conditions can be from one side of the Bay to the other, and one day to the next. Not the first time I’ve heard from a reader who just flat out doesn’t believe it’s possible to catch as good and often better fish by casting lures over trolling, live-lining, etc. If they only knew what fun they’re missing. Thanks to all for this great information, refresher, motivator etc. Sending the link to most of my buddies. Still learning but getting better! Shawn shot a video last July that really opened the Bay Bridge bite for me. http://www.youtube.com/watch?v=sH_3rC0sZ-Y It sounds crazy, but now I can tell when somebody knows what they’re doing just by the way they line up. Any tips for making jigs less enticing to rays? I caught 11 this weekend with three on three consecutive casts. Thanks for posting Shawn. That was a good review plus some new tips too. I really liked the “historic oyster bars” link. I need all the help I can get. Thanks again. Chris — I wish I did. (See next report.) Sometimes I’ve just had to move.